One of the hot topics in education is the role of robots in education. The latest interest in this education hot topic is revealed in a 2013 TV commercial showing a robotic virtual screen on wheels, with a child recovering from surgery in the hospital, while also remaining connected to his classroom studies. To help students from lagging behind in their studies, an advanced NASA styled tele-program now enables students who are unable to be in the classroom, to participate in classroom studies, via robotics. This tele-robot technology is a pairing for students who are recovering at home or in a hospital and their classroom instructors. One virtual robot TV screen is given to the student and another robot screen is located in the classroom. A virtual or live picture is displayed to both the student remotely and the classroom instructor. This amazing innovation is able to move around the halls of the school to enable students to be connected to all of their classes. With minimal instructions, a student with the aide of a joystick or a remote, can direct the TV robotic camera to scan the classroom to see, hear and answer the classroom instructor. Additional attachments include a scanner and a printer for the student to further participate in all classroom assignments. As a result of robotics in educational institutions, the hot topics in education include math, history, science, mechanics, engineering and more. Robotics as the latest in hot topics in education and is well accepted by young people who embrace the science because it is so similar to the home games which they play for fun everyday. Tele-robot technology has been used in space exploration, laparoscopic surgery and in unmanned military situations. Virtual video tele-robot technology has also been employed by law enforcement and industries that work with hazardous material. Designing this technology for use in our classrooms has proven very successful. Mobile robots like those used to help students and special education students, are mobile robots known as “automated guided vehicles.” They are programmed to navigate classrooms via invisible wires in the floor, lasers and Skype guided. With testing and research, studies have been compiled showing that robot technology helps to free the untapped potential in school age children who may be unchallenged or are socially awkward. Hot topics in education for kids and young adults toward robotics is providing creative outlets for our youth and the studies are peeking their interest in subjects that once gave them difficulty to learn. 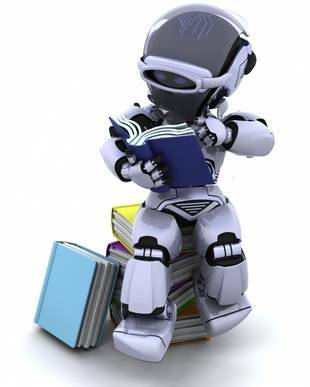 Robot designed studies have identified a variety of robotic subjects which have engaged youths throughout the world in increased learning knowledge and increased motivation. With the introduction of robotics in the classroom, new learning avenues have opened for children who are withdrawn, especially autistic children. 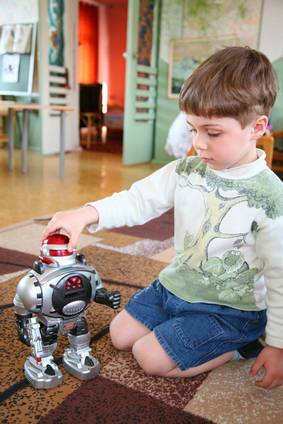 Autistic children are introduced to robots which are their size and are programmed to guide them through memory games, phonics and card games designed to reach their analytical and memory skills. Children who have autism do not relate well to adults and sometimes can not communicate with other children, but as soon as the autistic child is introduced to a human type robot, it is instant chemistry. Added hot topics in education for robots is how to program them to develop a child’s communication skills, learning skills and behavioral skills. Modern technology industries are looking for tomorrow’s scientists and engineers and the hot topics in education are needed to propel students to produce qualified graduates. Robotics is the study of intelligent connection through a machine like automatic device which performs functions ascribed to humans. Who knew that watching the Jetsons and the Star War robot technology would enter our classrooms so quickly. From 350 BC when a Greek mathematician built a mechanical flying bird to year 1958 when the Stanford Research Institute, designed robotic arms to go from an industrial use to present day use in aiding our children in their growth processes. Top colleges like Stanford are offering free introduction to robotic training with hot topics in education that include artificial intelligence studies, computer science and computer programming. Our pre-school children are introduced to touchscreen robot computers that talk to them to help teach them how to identify colors, shapes and pictures. Classroom teachers and instructors teaching our young minds, find that robot technology is easily assimilated by students and their joy in learning makes their classroom management a lot easier. Therefore, by introducing robotic hot topics in education, teachers and instructors have a classroom aide. More “smart boards” have replaced the old chalk board with flat screen monitors that are networked with computers in the classroom. Many smart boards are designed with using touch screen technology for students to use to answer questions, as well as using remote control panels. Robotics is being discussed by top toy manufacturers, telecommunication giants, healthcare leaders, leading educators and leaders in the technology industry. Their partnership is delivering modern solutions in initiatives that provide a brighter healthier future for your youths. Hot topics in education is about robot designing which puts our society on the brink of revolutionary technology that is transforming the way our young people think, interact and solve problems.